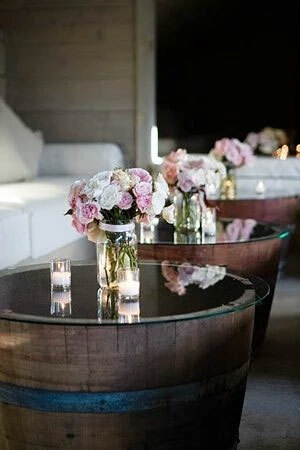 We have Half Wine Barrels with a smoked glass table top finish for a sleek statement piece for your next event. Our barrels are genuine French and American oak barrels cut in half and refurbished to bring out their naturally impressive appearance. We assure our customers that the smoked glass table top is secured on the barrel and will not slip. Extremely versatile, our smoked glass tables are ideal as coffee tables with stools or as display tables for flowers at special occasions or to showcase products to clients. Our chic coffee tables can also be used for serving food for children, providing them easy access with their safety in mind. We also hire out short Black Tolix Stools for our Smoked Glass Coffee Tables. 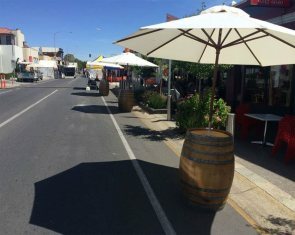 The hire price for the coffee tables is $75 plus GST and the short black Tolix stools are $8.00 plus GST. It's portable storage with rope handles and can contain ice. 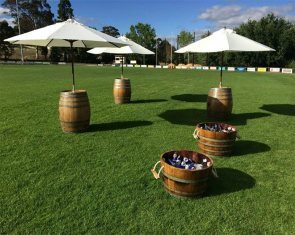 An ideal solution to keep your drinks cool. 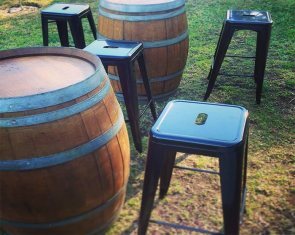 Mix and match these stools with our vintage wine barrels to create a unique setting for your event.